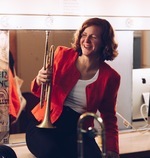 Ellen Kirkwood is a trumpeter, composer, bandleader and educator from Marrickville, Sydney. She studied Jazz at the Sydney Conservatorium under many Australian Jazz greats including Mike Nock, Warwick Alder, Judy Bailey, Matt McMahon and Dale Barlow. In 2012 she won the Jann Rutherford Memorial Award for young women in Jazz. In 2017 she was one of three finalists in the Freedman Jazz Fellowships. Ellen's debut album with sextet Captain Kirkwood released in 2013, named Theseus and the Minotaur, featured a 5 part narrated music-story suite which received glowing reviews and critical acclaim. She has received commissions from SIMA and Ars Musica Australis for works which premiered at the 2015 and 2016 Sydney International Women's Jazz Festivals, and from secondary school stage bands in NSW and Queensland. In 2016 she received a grant from the Australia Council for the Arts for a composition mentorship with stellar composer/pianist Barney McAll, during which she penned an epic 1 hour suite for 18 piece Sirens Big Band plus featured soloists, entitled [A]part. Ellen has performed with international artists Boy George (UK), Ingrid and Christine Jensen (USA/CAN), Lisa Parrott (USA) and Silke Eberhard (GER). Notable Australian musicians she has performed with include Sandy Evans, Andrea Keller, Gian Slater, James Greening, Greg Sheehan and Paul Cutlan. She performs regularly with successful Sydney groups Sirens Big Band, Mister Ott, On The Stoop, the Sydney Women's Jazz Collective and Facemeat, and leads her own groups Fat Yahoozah and The Mieville Project. "Ellen Kirkwood is open to the new and her music sounds like that. Her sound cauldron bubbles with mystery, wit and beauty." - Barney McAll.